A Food and Beverage minimum is required to be met for private dining & event rooms. Food and Beverage Minimum subject to change and availability. Menus are between $80-$165 per person. Please contact us for more information. All prices exclude current service charge and sales tax. A Food and Beverage minimum is required to be met for private dining & event rooms. Food and Beverage Minimum subject to change and availability. May include a venue fee. Menus are between $80-$165 per person. Please contact us for more information. The Carolina Room is adorned with built-in custom wine cabinetry and dark rich wood, showcasing a portion of our extensive wine collection. The Carolina Room is completely private with full AV capabilities. The large custom-made solid walnut table seats up to 16 guests comfortably. Atmosphere/Decor: Warm, neutral tones create a canvas for any style. 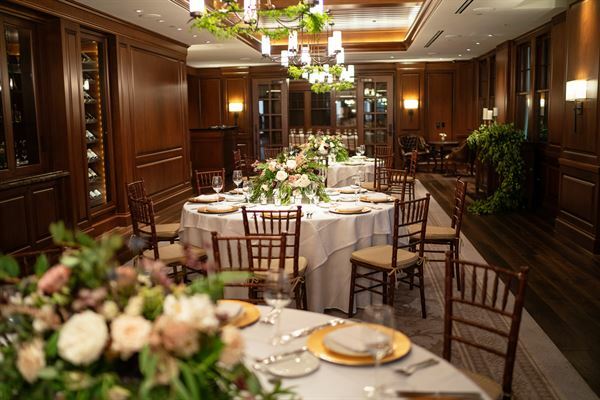 Adorned with floor to ceiling raised panel walls made of clear premium grade Alder, The Dining Room seats up to 72 guests and includes handsome built in custom wine cabinetry with the most distinguished wines on display. The Great Room seats up to 264 guests, featuring expansive views of the city during the day and spectacular views of the Disneyland Resort® fireworks by night! For smaller and more intimate events, The Hospitality Suite is a comfortable and cozy option for intimate gatherings and seats up to 100 guests. Intimate dinners and board meetings are a perfect match for The Lounge. Accented in warm rich earth tones, The Porch can accommodate up to 60 guests complete with its own bar and AV system for private events. THE RANCH Saloon is a fantastic venue for private events. With our state-of-the-art Meyer sound system, 40' x 23' concert stage and our custom made 47' x 26' sunken dance floor, it provides the perfect atmosphere to host large scale dinners, or cocktail parties. The Study is also perfect for intimate occasions with maximum seating up to 40 guests.